The flower is the centerpiece of angiosperm reproduction. 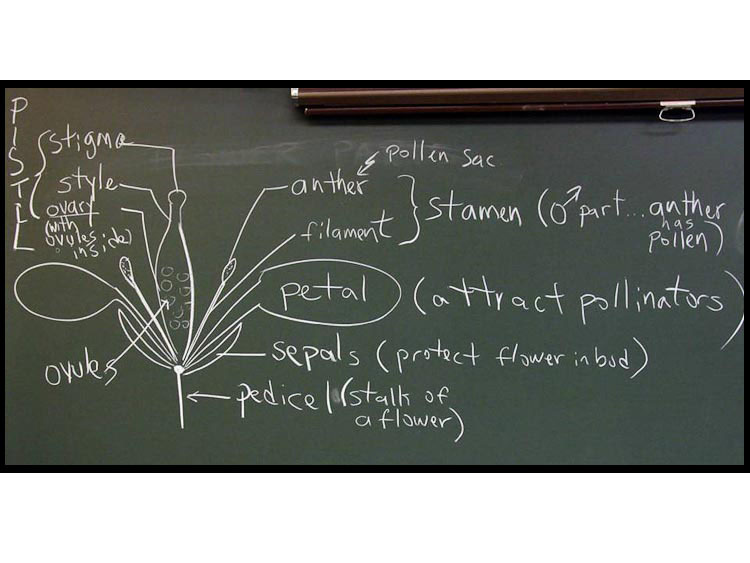 Named in order from bottom to top (as plants actually grow), a typical flower is a collection of parts, seen below in a very elegant diagram as presented to introductory biology students at a major Midwestern university. SLIDE the image to see a textbook depiction of the same material. Pedicel: the stalk of an individual flower. 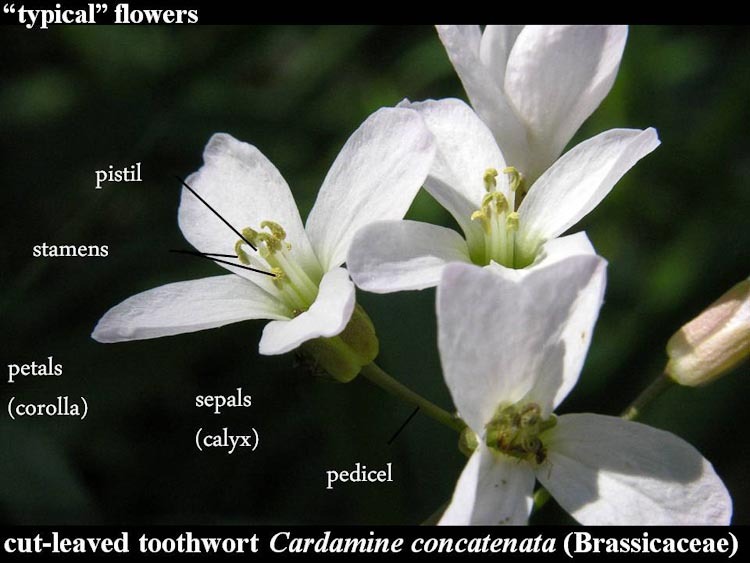 Sepals (collectively termed “calyx“): small green leaflike appendages that protect the flower bud. 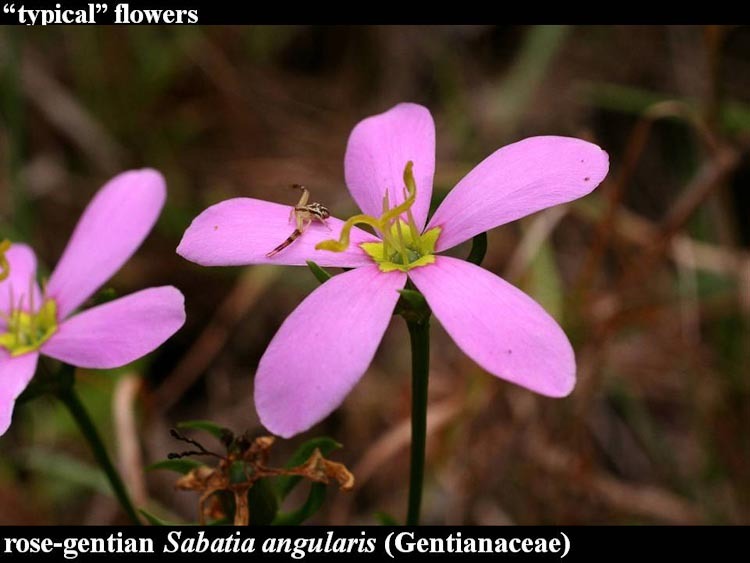 Petals (collectively termed “corolla”): large colorful appendages that attract pollinators. Stamens (collectively termed “androecium“): male organs consisting of a slender supporting filament tipped by the anther, which is a sac containing pollen grains. Each pollen grain contains two sperm cells, one of which typically fertlizes an egg in the female portion of a flower on another plant. 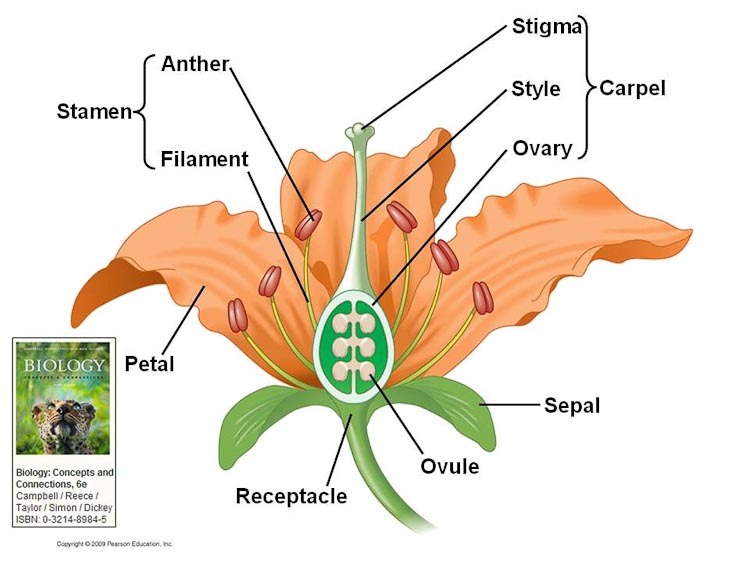 Pistil (also called “gynoecium” or “carpel“): the female part of the flower, with three parts: the lowermost, eventually seed-containing ovary, the style which serves as a conduit between the ovary and the uppermost part pollen-receptive stigma. Below, see cut-leaved toothwort. This is a woodland spring wildflower, one of many such plants that take advantage of the brief period when it is both sunny and warm in the forest –April through early May. SLIDE the image to see the parts labeled. and an androecium of 6 stamens (of which 4 are long and two are short). There is a single pistil, but it is actually composed of two fused units (carpels). 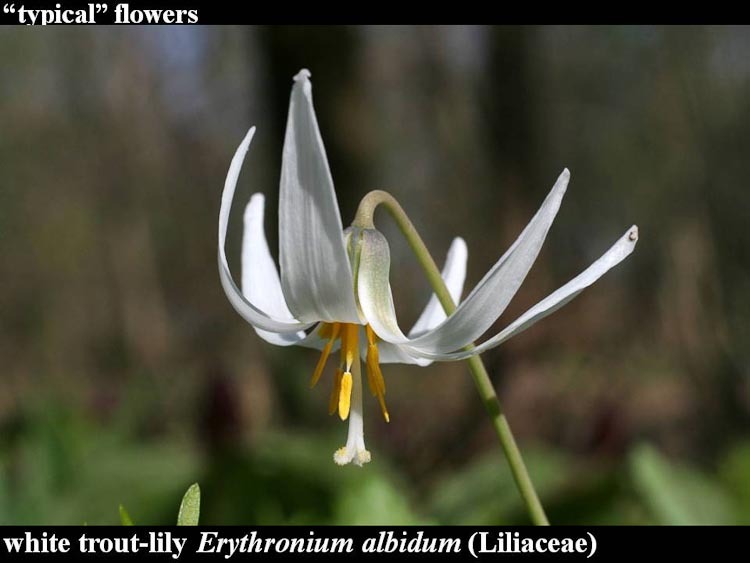 Below, white trout-lily. This is a woodland spring wildflower that sometimes occurs in prairies as well. The androecium consists of 6 stamens. There is a single pistil, but it is actually composed of three fused units (carpels). 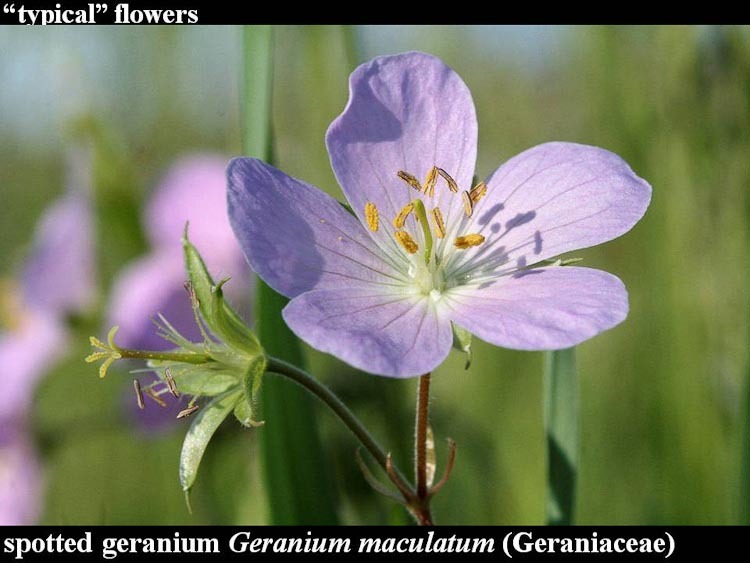 Below, wild geranium. This is a late-sping woodland wildflower. It demonstrates a feature of timing called “protandry,” a word that translates to “male first.” This is a floral mechanism that minimizes self-pollination by having the male and female sexual parts mature at separate times. 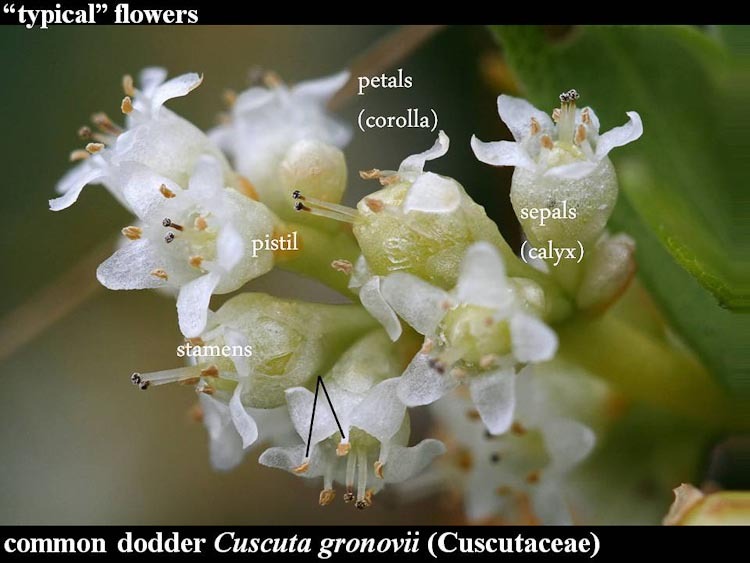 The newly-opened flower on the right has its stamens freshly burst open to release their pollen while at the same time its stigmas are clasped together, preventing pollen deposition there. Contrast that with the (very) late-stage flower on the left (from which petals have recently fallen), that shows the expanded and receptive stigma of the female phase. 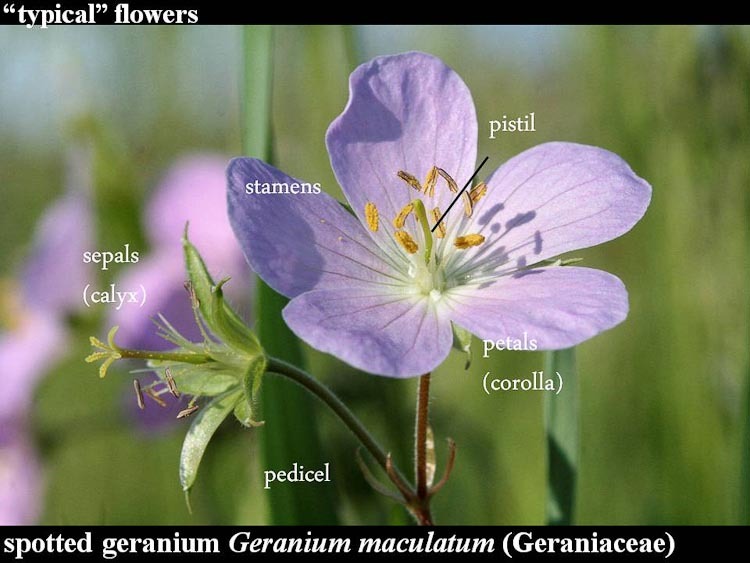 Spotted geranium has a calyx of 5 sepals and a corolla of 5 petals. The androecium consists of 5 stamens. There is a single pistil composed of 5 fused units (carpels). Below, rose-gentian. This is a late summer wildflower of open meadows and prairies. Rose-gentian has a calyx of 5 sepals and a corolla of 5 petals. The androecium consists of 5 stamens (the anthers are have fallen off this specimen). 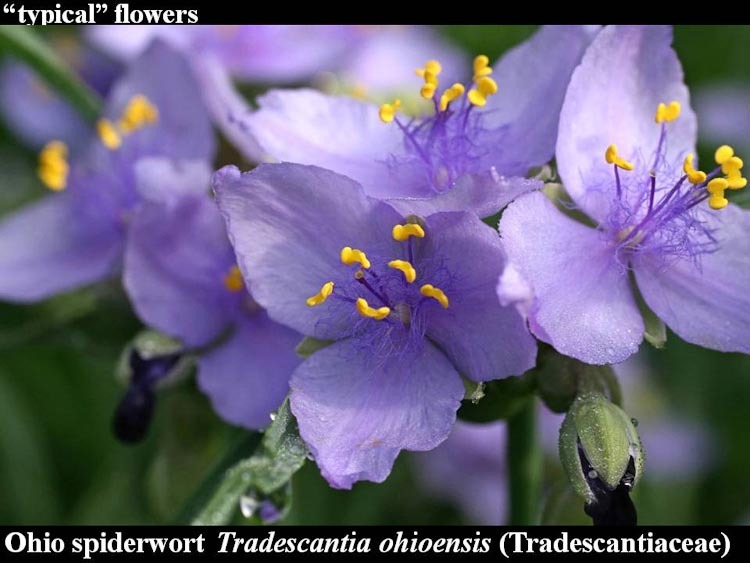 Below, ohio spiderwort. This is a prairie wildflower, one of the few to flower in spring instead of summer or fall. Several narrow leaves attached below the flower clusters assume an angled arch shape that is suggestive of a spider (or so they say). Spiderwort has a calyx of 3 sepals and a corolla of 3 petals. The andorecium consists of 6 stamens, with filaments that are distinctively long-hairy. Below, pawpaw. This is a clonal understory tree of tropical affinity. It produces deep maroon flowers that develop into soft greenish yellow fruits shaped roughly like an eyeglasses-case. For the picture, two foreground petals were removed to reveal the stamens and the pistil. and an indeterminate number of stamens. The pistil consists of two separate units (carpels). Below, dodder. This is a parasitic twining vine closely related to the morning-glory, that occurs as sprawling spaghetti-like masses on soft-stemmed herbaceous plants. In central Ohio, dodder seems to be especially common along watercourses. and an androecium of 5 stamens alternating with the corolla-lobes. 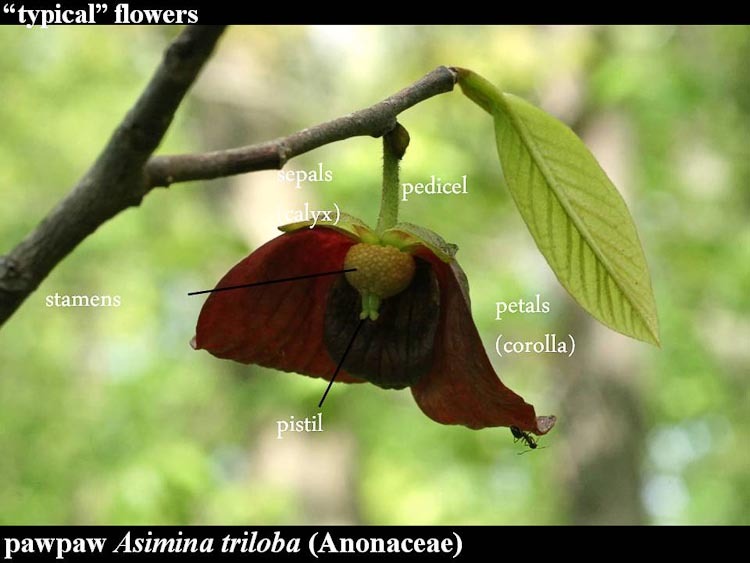 The pistil consists of two fused units (carpels).